The Alberta government, continuing to press its case for the Keystone XL pipeline, has taken out an ad in Sunday's New York Times newspaper, tying the controversial project to core American values and to U.S. pride in its military. 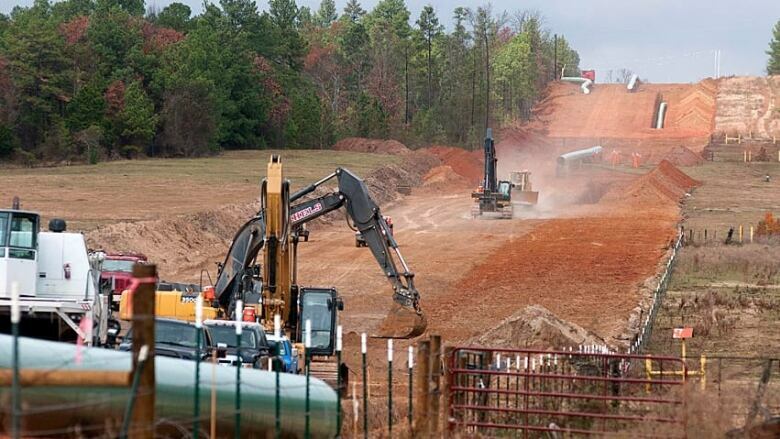 Crews work on construction of the TransCanada Keystone XL Pipeline east of Winona, Texas, on Monday, Dec. 3, 2012. The Alberta government, continuing to press its case for the Keystone XL pipeline, took out an ad in Sunday’s New York Times newspaper, tying the controversial project to core American values and to U.S. pride in its military. The half-page ad is headlined "Keystone XL: The Choice of Reason." "America’s desire to effectively balance strong environmental policy, clean technology development, energy security and plentiful job opportunities for the middle class and returning war veterans mirrors that of the people of Alberta," reads the $30,000 ad. "This is why choosing to approve Keystone XL and oil from a neighbour, ally, friend, and responsible energy developer is the choice of reason." Stefan Baranski, a spokesman for Alberta Premier Alison Redford, said the ad was taken out to counter a New York Times editorial that ran a week ago urging U.S. President Barack Obama to reject the 1,800-kilometre TransCanada line. "It’s important for Alberta to get the facts on the table as widely as possible," said Baranski. "Certainly the Sunday Times is a critically important audience to speak to, and I think Alberta has a good track record, a very good story to tell, and it’s important that we’re out there telling that story at this very critical time." "In itself, the Keystone pipeline will not push the world into a climate apocalypse. But it will continue to fuel our appetite for oil and add to the carbon load in the atmosphere. There is no need to accept it," said the editorial. It also makes the case, suggested previously by Redford and others, that the oilsands have been unfairly scapegoated despite much larger emitters burning coal on both sides of the border and around the world. "Greenhouse gas emissions from all the oilsands in Alberta, Canada, make up just over one-tenth of one per cent of the world’s emissions," said the ad.